Harbor West is having a Spring 2018 litter. Ch. 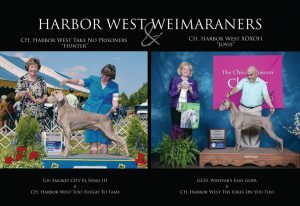 Harbor West XOXOH “Jovie” has been bred to Ch. Harbor West Take No Prisoners “Hunter”. Puppies were born on March 27, 2018; one boy and one girl. There are no available puppies at this time, but we encourage you to reach out to the Weimaraner Club of America’s breeder referral program. If we do not have a puppy available for you and are interested in a purebred weimaraner from a responsible breeder, please contact the Weimaraner Club of America’s breeder referral program. If you are interested in a future Harbor West Weimaraner, please complete the application and contact us. Moderately long and aristocratic, with moderate stop and slight median line extending back over the forehead. Rather prominent occipital bone and trumpets well set back, beginning at the back of the eye sockets. Measurement from tip of nose to stop equals that from stop to occipital bone. The flews should be straight, delicate at the nostrils. Skin drawn tightly. Neck clean-cut and moderately long. Expression kind, keen and intelligent. Ears–Long and lobular, slightly folded and set high. The ear when drawn snugly alongside the jaw should end approximately 2 inches from the point of the nose. Eyes–In shades of light amber, gray or blue-gray, set well enough apart to indicate good disposition and intelligence. When dilated under excitement the eyes may appear almost black. Teeth–Well set, strong and even; well-developed and proportionate to jaw with correct scissors bite, the upper teeth protruding slightly over the lower teeth but not more than 1/16 of an inch. Complete dentition is greatly to be desired. Nose–Gray. Lips and Gums–Pinkish flesh shades. The back should be moderate in length, set in a straight line, strong, and should slope slightly from the withers. The chest should be well developed and deep with shoulders well laid back. Ribs well sprung and long. Abdomen firmly held; moderately tucked-up flank. The brisket should extend to the elbow. Coat and Color Short, smooth and sleek, solid color, in shades of mouse-gray to silver-gray, usually blending to lighter shades on the head and ears. A small white marking on the chest is permitted, but should be penalized on any other portion of the body. White spots resulting from injury should not be penalized. A distinctly long coat is a disqualification. A distinctly blue or black coat is a disqualification.